For more than 30 years, Disney has been a staunch supporter of Make-A-Wish, welcoming children with critical illnesses to “The Happiest Place On Earth.” In fact, Disney and Make-A-With will grant their 100,000th global wish together in 2015. One of the companies owned by Disney, ESPN, has been doing its part to help grant wishes, as well. 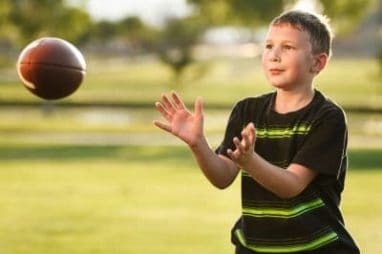 Starting on Sunday, July 19, ESPN will air the 10th year of the “My Wish” series, where it helps children who have wishes involving sports teams or athletes have their wishes revealed and granted in a made-for-TV segment. ESPN has worked with Make-A-Wish to fulfill 50 sports-themed wishes since the series started in 2006. ESPN produces feature segments on the wishes for airing on SportsCenter, with the first wish debuting in the 11 p.m. EDT edition on July 19. The remaining four will premiere at 6 p.m. on SportsCenter Monday-Thursday, July 20-24, with a one-hour special featuring highlights of all five wishes airing Thursday at 7:30 p.m. on ESPN. Sunday, July 19: San Francisco 49ers: Anthony Pineda, a 14-year-old from San Bernardino, Calif., who has been battling leukemia, wants to spend time with the 49ers and get a jersey signed for his father figure who recently died after a sudden illness. Monday, July 20: Michael Phelps: Sixteen-year-old Hailey Cannaday of Clintonville, Ohio, hasn’t let osteosarcoma affect her dreams of swimming in college. With her Olympic idol, she gets a tour of the U.S. training facility and makes a splash in the pool. Tuesday, July 21: WWE Superstar John Cena: Seven-year-old Kenneth “KJ” Harmon of Orlando, Fla., is battling end stage renal disease. He heads to Washington, D.C., to get a behind-the-scenes glimpse of WWE from Cena. Wednesday, July 22: Andrew McCutchen: Sean Campbell, 10, of Leonardtown, Md., born with a serious heart defect, gets to spend time with his favorite Pittsburgh Pirates player. Thursday, July 23: Maya Moore: Even suffering from Lupus with life-threatening complications hasn’t quelled the dreams of 14-year-old Ariya Smith of Thornton, Col., who hopes to someday play in the WNBA. She gets one-on-one practice time with the Minnesota Lynx star and is a guest of honor at the team’s home game. Whether you live in Naples, Sacramento, Minneapolis or Nashville, you can help Make-A-Wish no matter where you live. You can help bring joy to children with critical illnesses and all you have to do is to make a car donation to Wheels For Wishes, the car donation program benefiting Make-A-Wish. We support many local chapters of Make-A-Wish with the proceeds from car donations. When you donate a car, truck, boat, RV, motorcycle or other vehicle, you can support your local chapter of Make-A-Wish, which helps them to grant more wishes for children in your community who could use more hope, strength and joy during a difficult time in their lives.